The November issue of Cooking Light has a feature on winter squash, with some of the coolest recipe ideas I have seen in a while. It definitely inspired a full on squash obsession for me. As evidence - after I read the magazine, I went out to the farmers' market and bought 7 squashes, and only 2 of them made it through the weekend without being cooked. Honestly, I haven't been this excited about squash since I was an infant! (apparently it was my favorite baby food). 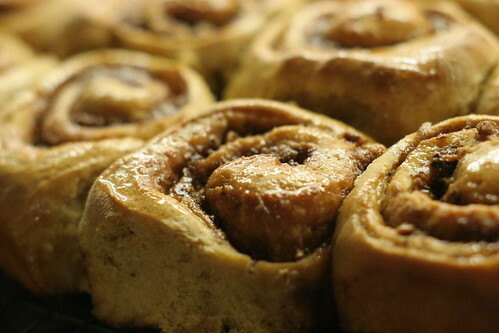 Anyway, I thought these cinnamon rolls were such a fun way to use squash. If you're thinking that baking with delicata squash is weird, just remember that it is essentially the same as baking with pumpkin. 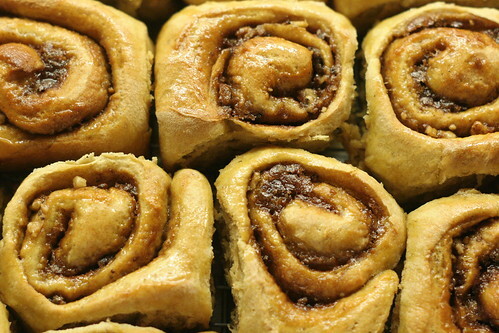 The pureed squash adds sweetness and moisture to these rolls, which are deliciously spiced and drizzled with a maple glaze. They are great for dessert as well as breakfast. Do you ever make baked goods with winter squash? I used white whole wheat flour instead of the all-purpose that was called for in the original recipe. I enjoyed the depth of flavor that it added, but if that's not your thing, then use all-purpose. Also, don't even be tempted to skip the maple glaze. It's the perfect finishing touch and the rolls will be a bit dry without it. Preheat oven to 450 deg F. Halve squashes lengthwise and scoop out seeds. Spray cut surface with cooking spray, and place squash halves in a baking pan, cut sides up. Roast in the preheated oven until very tender, about 30 minutes. Scoop out flesh and puree in a food processor until very smooth. Measure out 1 cup of puree and reserve any extra for another use. Combine yeast, warm water, and 1 tbs sugar in a small bowl and let sit for 10 minutes. Combine bread flour, 5.63 ounces (about 1 1/4 cups) white whole wheat flour, 1/2 tsp cinnamon, nutmeg, and cloves in a large bowl and whisk to mix. Add yeast mixture, 1 cup of squash puree, and oil and stir with a wooden spoon or whisk until just moist. Turn dough out onto a well-floured work surface and knead until smooth and elastic, about 6 minutes, adding extra white whole wheat flour 1 tbs at a time if needed to prevent dough from sticking (dough should be tacky but not sticky). Coat the inside of a large bowl with cooking spray. Place dough in bowl, turning to coat with oil. Cover bowl with plastic wrap and let rise in a warm, draft-free place until doubled in size, about 45 minutes. Punch down dough and then cover and let rest for 5 minutes. Turn dough onto a well-floured work surface and roll out into a 20 x 12-inch rectangle. Combine 1 tsp cinnamon, brown sugar, melted butter, and 2 tsp water in a small bowl. 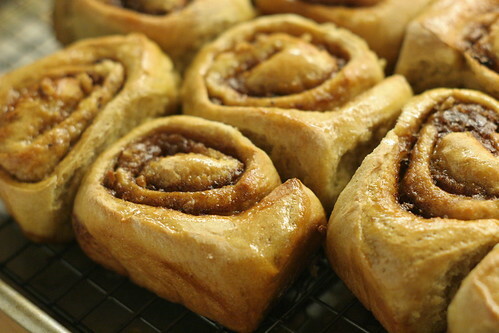 Spread sugar mixture evenly over the dough and sprinkle with walnuts, Roll up the dough, starting with the long side. Cut the roll into 16 even slices and place in a 9 x 13-inch baking dish coated with cooking spray. Cover dish with plastic wrap and let rolls rise until doubled in size, about 30 minutes. Preheat oven to 375 deg F. Bake rolls in preheated oven until brown, about 33 minutes, then place pan on a rack to cool. While rolls cool, make glaze. Stir together 1/3 cup water and maple sugar in a small saucepan. Bring to a boil over medium-high heat then reduce heat and simmer mixture for 5 minutes, stirring occasionally. Remove pan from heat and stir in butter, half-and-half, and vanilla extract. Let glaze cool for 5 minutes then drizzle over rolls as evenly as possible. These look really interesting! I make baked goods with pumpkin and butternut squash pretty frequently, but I've never used a delicata squash in baked goods. Delicatas have such a unique flavor, too - I imagine these are delicious! I love winter squash and have a big basket of them here for the fall/winter. I'm not usually the biggest fan of Cooking Light but this months' issue was really quite awesome. Somehow I missed these cinnamon rolls though...thank god you posted them! They look amazing. What a unique recipe! I never would have paired squash and cinnamon rolls but it looks like it really works!